Bellgrove Hotel owners Ron Barr and Kenneth Gray earn around £1.5m annually from people who live in the run-down hostel. Landlords have been slammed by union chiefs after it was revealed the owners of a Glasgow homeless hostel are making more than £1.5m. Ron Barr, 80, and Kenneth Gray, 69, take in around £1.5m annually from people who live in the run-down Bellgrove Hotel in the city’s east end. The tenants' housing benefit equates to up to £199.25 each week. The figures were revealed on Monday in the Daily Record newspaper after an investigation by the GMB union. In 2012-13 Bar and Gray received at total of £1.56m from housing benefit, £1.49m the previous year and £1.45m the year before that. In 2000 it was described in a BBC documentary as Scotland's worst homeless shelter and a "dumping ground for people who have been really abandoned by the statutory services". Glasgow City Council stopped referring people to the facility, which is not subject to care regulations as it is listed as a hotel whose residents pay for their rooms with housing benefit in 2010. Other Scots landlords mentioned in the GMB investigation include the Earl of Strathmore and Kinghorne, who is the Queen's cousin and owner of Glamis Castle, who received £11,500 from Angus. The Earl of Moray, owner of Darnaway Castle received £10,000 and Martin & Co Letting Agents received £26,000 from Stirling, £365,000 from Fife, £78,000 from Clackmannanshire and £182,000 from South Lanarkshire. The full list of landlords receiving housing benefit can be found her on the [http://www.gmb.org.uk/newsroom/landlords-hit-housing-benefit-jackpot](GMB website). Paul Kenny, GMB General Secretary, who obtained the figures, slammed the “fat cat” landlords and called for change. He said, "This lifts the lid on the mainly secret payments to landlords who are the real winners from Britain's welfare system. We see taxpayers cash subsidising buy-to-let empires where the money ends up tax free in tax havens. "The research shows the rich and powerful sucking up taxpayer’s money through housing benefit. This is made possible by out of control rents and a lack of affordable and council homes that so many hard working people and their families desperately need. "This should bring both shame and action from this government to end this exploitation of public money. These billions going into fat cats wallets and off shore tax havens would be better spent building houses and homes for real working people. "Shovelling millions of pounds to the likes of castle owning barons, whilst so many either wait for a home or have to pay exorbitant rents, is a public scandal. It is also bad economics for the nation. "It is disgraceful that 69 councils refused to reveal the companies they paid huge sums to. Every council has refused to disclose the names of private landlords they pay huge sums to without scrutiny." 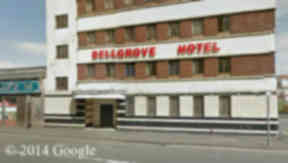 A spokesman for Glasgow City Council said: "We stopped referring those affected by homelessness to the Bellgrove Hotel in 2010. "Accommodating individuals in large-scale hostels makes it much harder to address the issues that led to their homelessness. "Social care and health supports are available to those who stay at the Bellgrove and we look to assist residents back to mainstream housing wherever possible."